The Jim Street Golden Sahara II is being restored at the Speakeasy Custom and Classic Shop. A closer look at who they are. 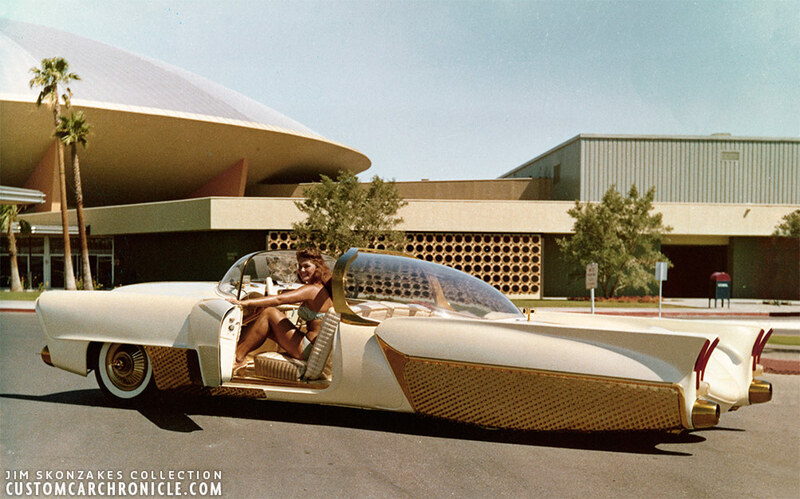 The Golden Sahara II in its glory days. 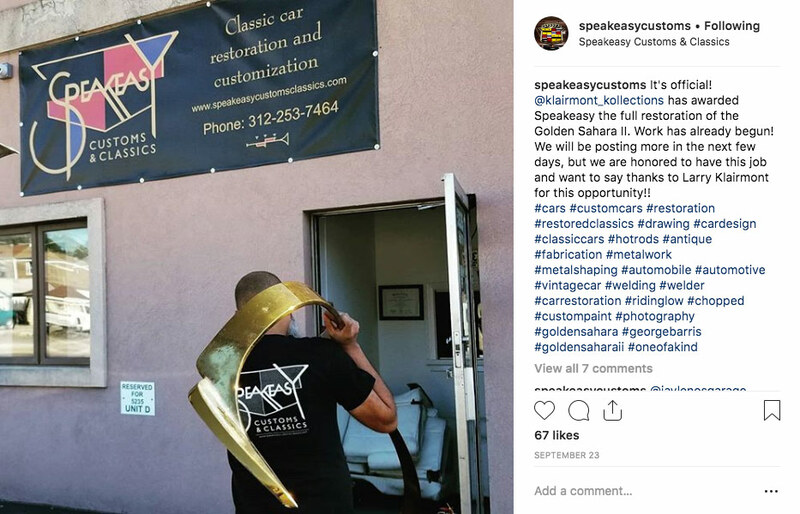 The announcement made by Speakeasy Customs on their Instagram page. We had never heard about the Speakeasy Custom & Classics shop before, so we were intrigued. I contacted the shop to share a bit of information how I had a very special connection with the Golden Sahara, and its former owner Jim Street. And how I would love to be kept in the loop on the restoration and how I was very interested to know a little more about the Speakeasy Shop and their relation to the Klairmont Museum. 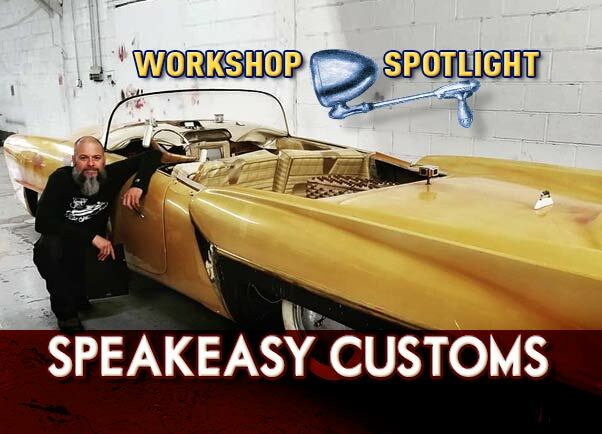 Greg Alonzo, the owner of Speakeasy soon got back to us, and informed us that when time permitted he would love to share a bit more about the history of his shop. But that he would be very busy for a while with the Golden Sahara restoration. Greg had already shared some photos and info of the start of the restoration on the companies Instagram. But now The Klairmont Museum had set a new deadline for the restoration, for a special event, and the complete restoration would be documented in a film. Because of that Greg would not be able to share any new photos, or info on the Golden Sahara, until the movie was released. As soon as we can we will be sharing the full story on the restoration and the special even here on the Custom Car Chronicle. The Speakeasy shop visiting the Klairmont Museum to inspect the Golden Sahara and to discuss all aspects of the restoration. The Golden Sahara as it sat in the Museum prior the restoration. The car was cleaned up and detailed from being in storage for several decades. The ones pearl white paint had turned yellow brown. Interior and engine details. Everything will need to be cleaned, and or fixed during the restoration. Before the Golden Sahara was relieved to the Speakeasy Shop the shop started the project with restoring the Henry Meyer/ Bob Metz created hubcaps. Originally the hubcaps illuminated the Good-Year glass tires and the center of the hubcap lite up as turn signal. 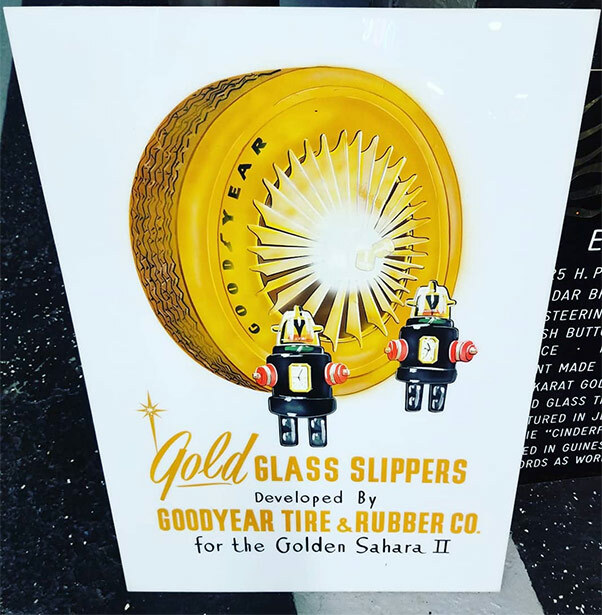 It is rumored that Good-Year will be reproducing the special “Glass Tires” for the Golden Sahara II. My name is Gregory Alonzo, I am 43 years old, I live in Chicago Illinois and I am the owner of Speakeasy Customs & Classics. We are the shop that has been chosen by Klairmont Kollections to restore the Golden Sahara II and bring it back to the public eye. Because the restoration is being filmed I am unable to talk much about that just yet, but I wanted to share with the world who I am and where my shop came from. Greg posing with the Golden Sahara II shortly after it was delivered at his Speakeasy Shop in Bedford Park/Chicago. Speakeasy Customs & Classics is in Bedford Park, Illinois. 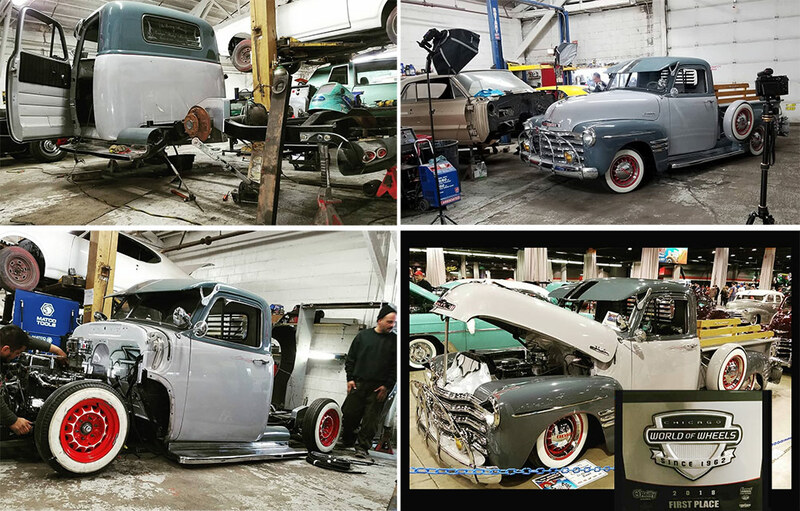 We are a full restoration shop that specializes in Customs and Lowriders. We do everything from metal work to paint and everything in between. We do all types of custom work like air ride and hydraulic suspension, custom interior work, and of course custom paint work. Besides being owner I am also the welder/fabricator as well as the social media/marketing guy and so much more. However I have not always worked with cars. As a matter of fact I have spent the majority of my working career behind a desk. But it was never anything I really enjoyed, mostly corporate jobs, I was even a doorman for a downtown high rise for a few years. I have however always had a passion for classic cars of all types. When I was a kid I would build model cars and of course always find a way to customize or modify them somehow. I still have a few of them. Then when I was in High School my first car was a 1966 Plymouth Fury III, with a 383 and a 4 barrel carb. Probably way too much car for a 17 year old kid but man that big boat could move! That car was actually my first taste at restoring a car. My older brother Alex smashed the front end one day! So I took on the task of fixing it myself. I had to find parts the old fashion way, with a Hemmings catalog I found a new hood and fender from Arizona. I had no idea what I was doing, but I managed to swap out the damaged parts, and even straightened out the damage to the grill and headlight bezel. I never repainted it, but at least she was whole again. I of course did what most do and eventually sold that car to buy a more reliable one that would get me to work every day! Fast forward about 20 years and you pick up where my life of cars really began. In 2014 I found myself in a deep depression that was brought on by the sudden passing of my mother at only 58. Soon after that my father-in-law, who had been a part of my life for over 20 years, was diagnosed with cancer and passed 5 months later. At the time I was working from home with my wife. She owns a pet sitting and dog walking business in the city. Only I was not much help still be depressed. I woke up one morning and I knew I had to make a change. The thing that brought me the most joy were cars, classic cars and I decided that was what I wanted to do. I wanted to build cars. Easier said than done right? I figured a good place to start would be school, well there are not any restoration schools in the Chicago area, plenty of automotive programs but none that were only about restoration. 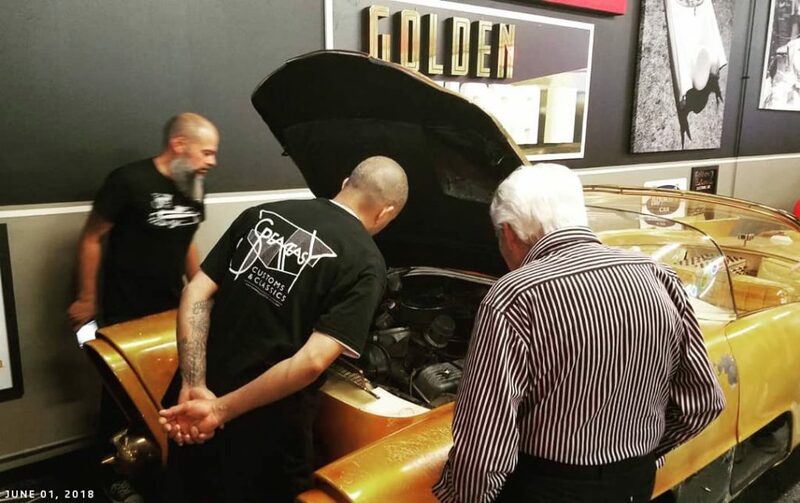 So I got involved with a mentoring program that uses classic cars to mentor youths, there I started to learn there everything I could about restoring them in return I would help out with the program where ever I could. I started with some basic body work and then a few months later I took a welding class and that was it, I was hooked! A year later I decided to go back to school and enrolled in the automotive program at Morton College, where I have completed 23 credit hours with a 4.0 GPA. 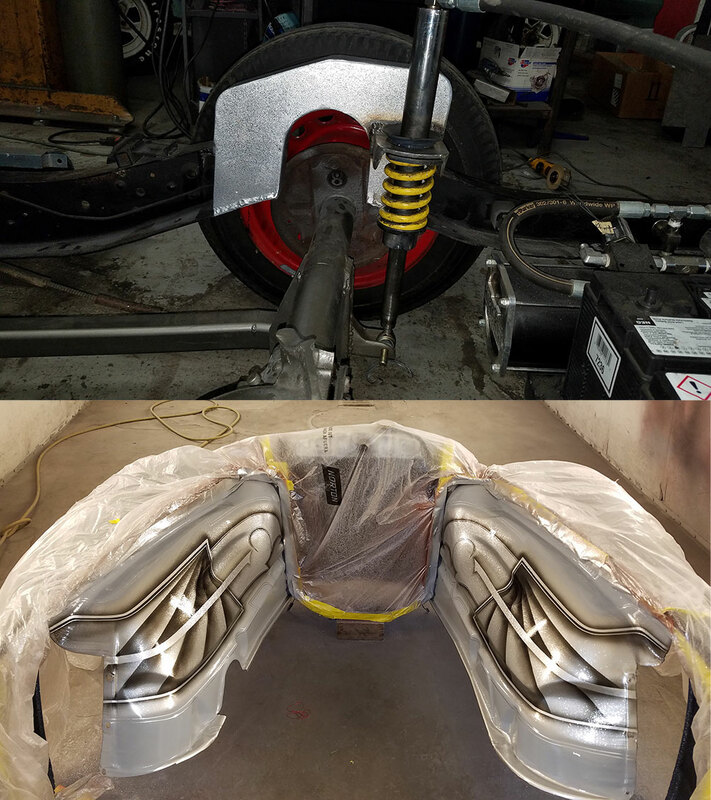 Now my specialty is welding and metal fabrication, however I can also do bodywork, paint and I know a lot of basic mechanics as well as hydraulics and air ride systems. Greg posing in fron of “La Coonster” 1953 Chevy Pick-Up. 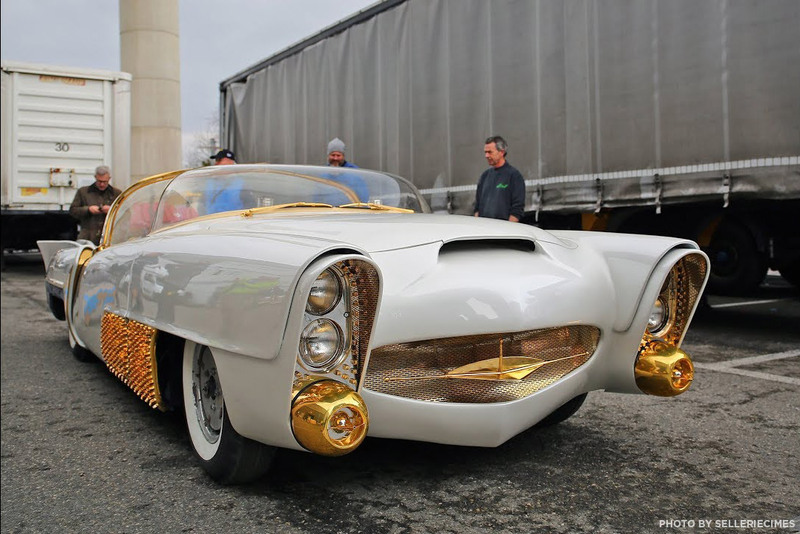 This is “La Coonster” It was originally built by Hollywood Customs. The Pick up was brought to us for a Mustang II front end with rack and pinion steering. We also did a “C” notch of the rear frame and redid the hydraulic setup to hide it all under the bed without having to raise the bed. We also did a ton of custom art work under the hood. 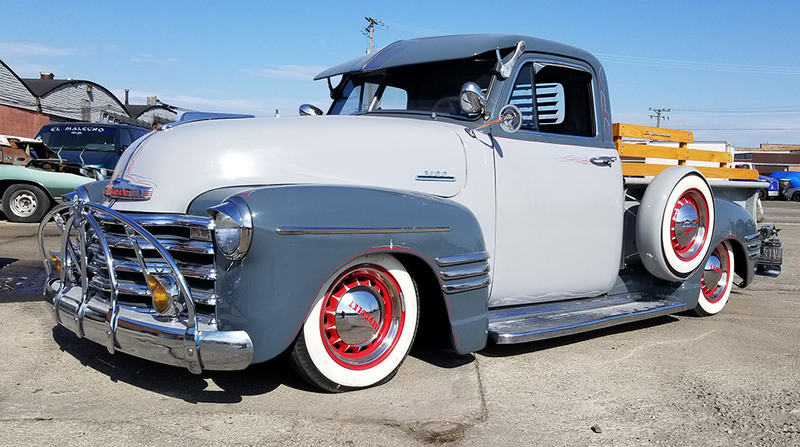 The 1953 Chevy won first place in the “Bomb” category at the World of Wheels Car Show in Chicago in March 2018. 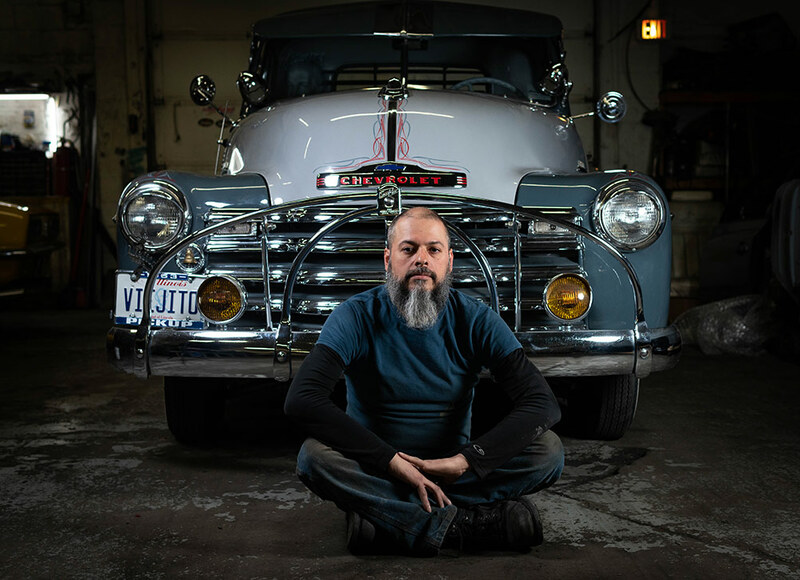 Two and a half years ago I started working for Armando Alba, at his shop Mando’s Customs, which specialized in building Lowriders with a Midwestern style. There I was really able to hone my skills since I was able to work on so many cars and learn more than ever. During that time I had begun to develop my plans for Speakeasy. I really enjoyed working for Mando but in my heart I knew I wanted to own my own shop someday. Well towards then end of 2017 Mando informed me he may have to close the shop. But I was not ok with that. When he first told me I tried to work with him to find a way to keep it open, but in the end he decided he really did not want to run a shop anymore. In January 2018 he asked me if I would be interested in buying him out and changing Mando’s into Speakeasy Customs & Classics. I was hesitant and first but in the end I took over the shop on March 12, 2018. My first task was to hire Mando as my shop manager and painter! 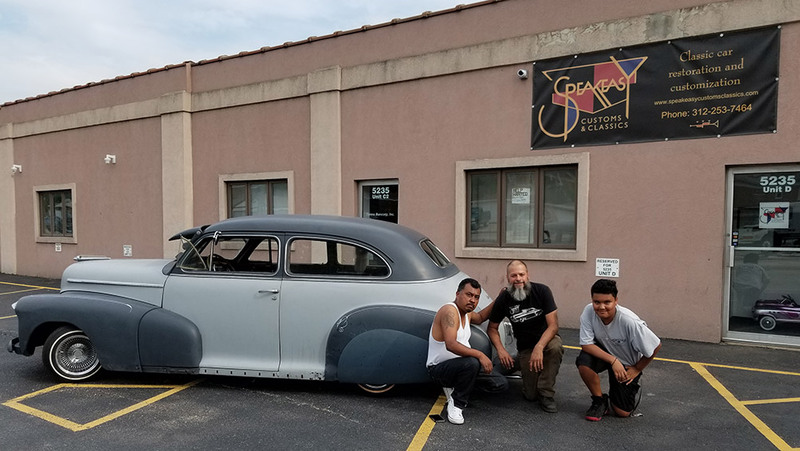 Greg with Armando Alba and Manny Lopez with a client’s 47 Chevy in front of the Speakeasy shop. Armando Alba is the glue that keeps the shop together. He has been working on cars pretty much his whole life. Born in Juarez Mexico he moved to El Paso Texas when just a few years old and lived there till he was in his teens, he then moved to Chicago. As a teenager he was very into drawing and all types of art work. He began his career in custom work when he started to customize his bikes. He would paint them over and over, swap seats and other parts, and personalizing them. As he got older he was leaning more and more towards cars and he found a passion for Lowriding. Mostly because of the culture that came with it, but also because he was able to incorporate his love of art into his building of cars. 1958 Chevy which was just painted. His first job was at a parts store in 1999 and he worked there till he got a job managing an auto shop in 2006. In 2011 he opened his first shop, a regular repair shop. 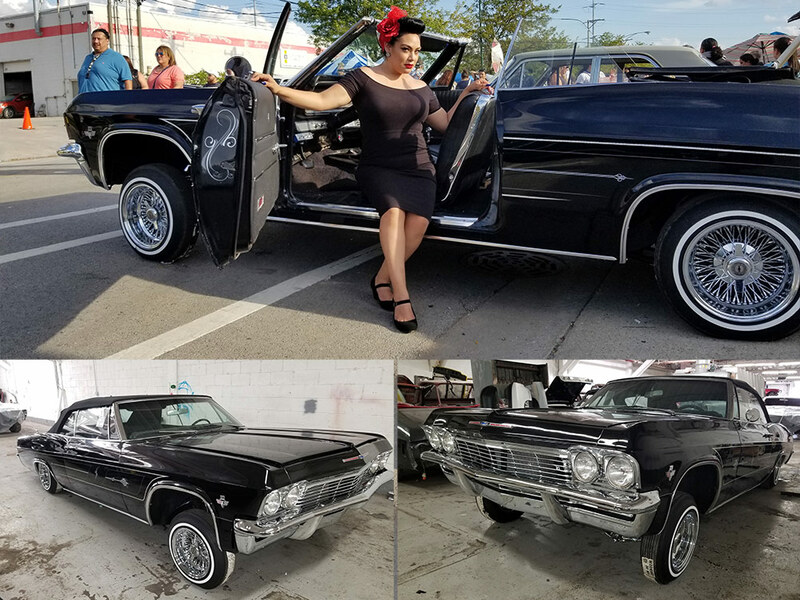 While he ran that he was building his 1963 Impala lowrider “Medio Oeste”, which means Midwest in Spanish. When he started to show it is when he started to get requests from people to build their cars and Mando’s customs was born. He continued to run that shop until he decided to work with me to turn it into Speakeasy Customs & Classics. 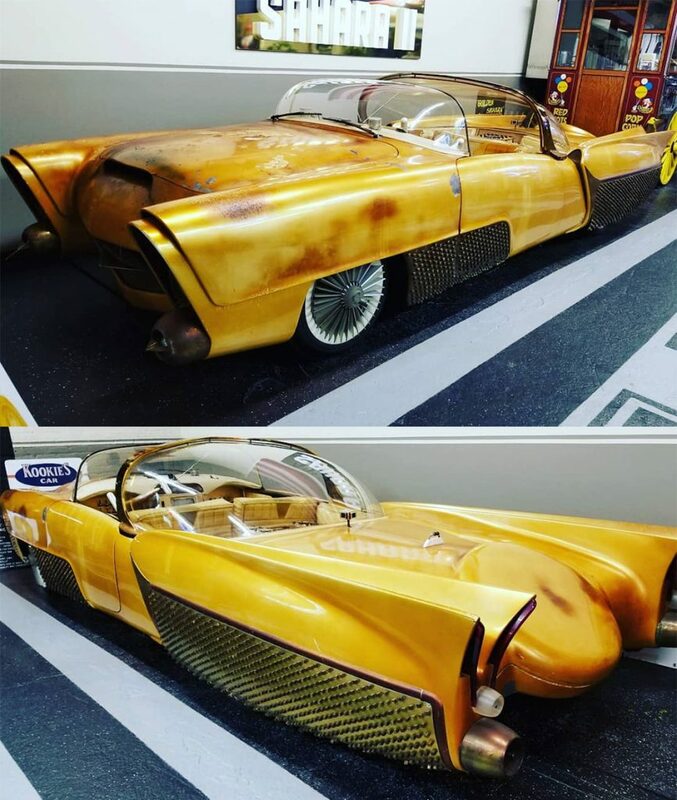 Mando is an amazing painter that can do all types of artwork with paint including pin striping, silver/gold leaf, patterns of all types and so much more, but not only that he can build a car from start to finish on his own if he had to. 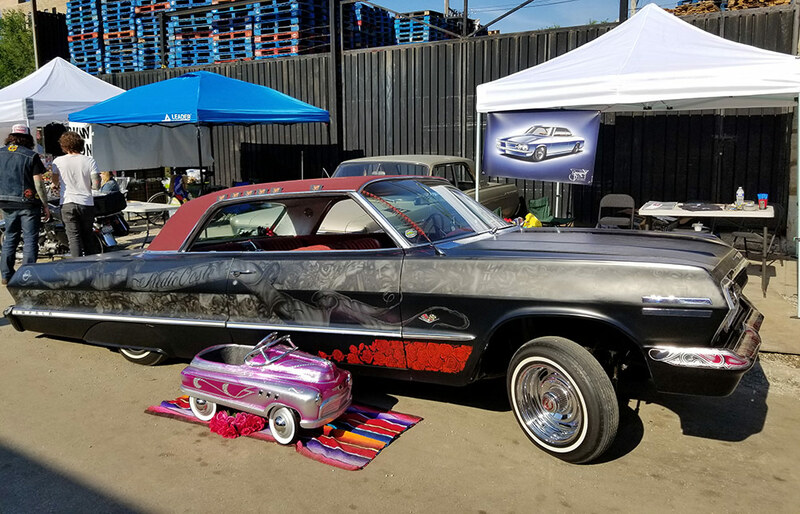 Mando’s 1963 Chevy Impala “Medio Oeste”, and his Daughter’s Pedal car, all work on both was done by Mando. 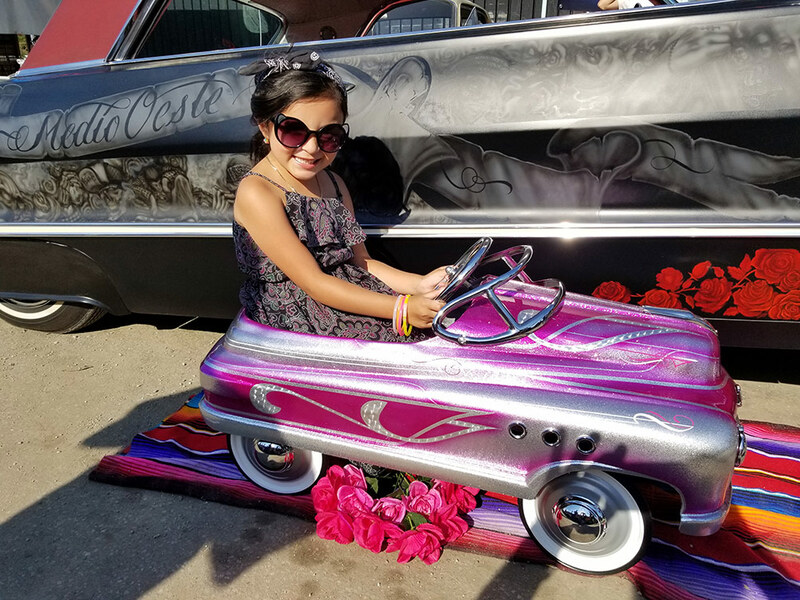 Mando’s daughter posing with the pedal car here father created. The rest of my team consists of Angle Alba, Mando’s son. Angle is 19, and started working in the shop in 2017 when he moved to Chicago to live with his father from El Paso, Texas. He started to work with him and began learning body work and paint and he also helps with a lot of the finishing work and final assemblies. He is currently enrolled at Lincoln Tech College where he is taking collision repair so he can advance his skills. 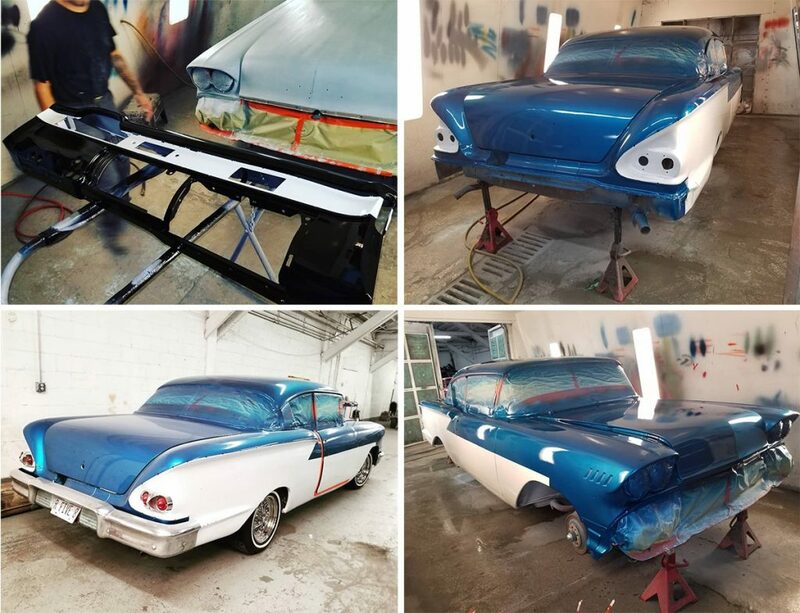 He is working on a 1964 Bel Air Lowrider that should be ready by next summer. 1965 Chevy Impala the shop built for a client in California, that’s unique because normally people send cars to California for this type of work, so it was very cool to have a Cali car sent to us. Adrian Arreola, Mando’s stepson, is 23 and has been working with his dad on cars since he was 13 years old. He does a lot of the wet sanding and buffing after paint, helps with final assemblies and does a lot of metal finishing as well. Jesus Gonzalez does a lot of our electrical work as well as mechanic work. He helps with engine swaps and suspension work including air ride and hydraulics. He is 29, born in Villahermosa, Tabasco, Mexico. He moved to the Chicago area in 1994 when he was 5 years old, and also started working on cars with father when he was only 13. Later he took the same automotive program that I was enrolled in at Morton College. He has specialized in installing stereo equipment and mobile electronics of all types and he assists Mando with the wiring and plumbing of hydraulic and air ride systems. He is in the process of building a 1967 Chevy Camaro. This is “Crush” as in Orange Crush. All of the paint, gold and silver leafing art work and pin striping was all done in house by Mando. Mando also did the custom trunk and hydraulic set up. I did the trunk panels all out of 1/4″ thick PVC panels. Finally we work with a freelance designer, Mike Herbert, who does all of our art work and renderings and even came up with our Logo. He has the ability to help us work with our clients and help them see their final product before we even begin to work. 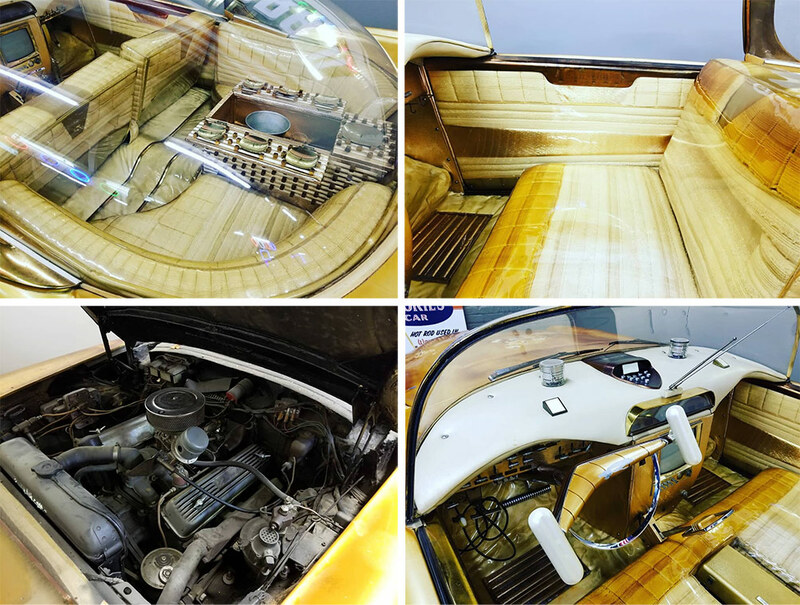 He can even take a client’s build to a whole new level by designing one of a kind parts that he can then design in 3D that be turned into reality by means of 3D printing, engraving and even casting. 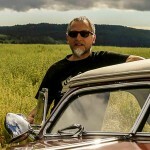 Mike has experience in the product design industry and is involved with a local car design community called Old School Car Class that integrates automotive history and future with students and enthusiasts. 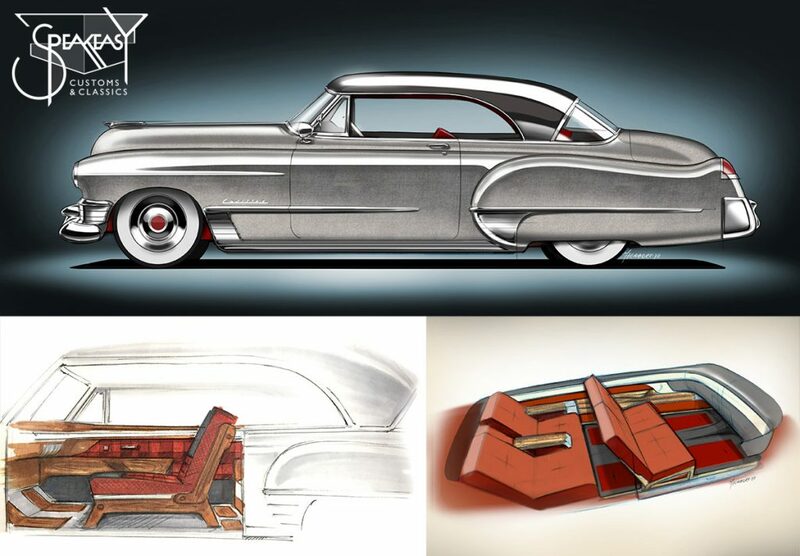 One is of the 1949 Cadillac Coupe De Ville we are building, its a full custom that will be in bare metal and have custom designed interior by Mike Herbert, the final interior has not been settled yet but here are 2 examples of what we are going for. 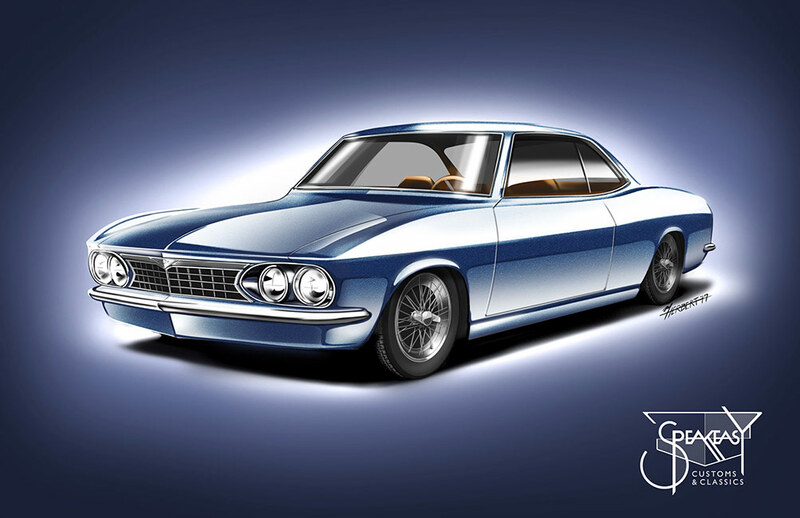 The last picture if of Greg’s personal 1966 Corvair Monza that they are building for a show car for the shop. We have designed it to have the feel of a 60’s Ferrari, hence the egg carton grill! Interesting article Rik. Thanks for the info. This whole thing still seems odd to me pulling a historic custom from someone like Voodoo Larry to take it to what looks to be essentially a lowrider shop doesn’t seem to make a lot of sense but it’s not my car or money so hopefully everything works out in the end. I assure you nothing was ‘pulled’ from anyone. The decision made by the vehicle owner on where to have the work done was based on many factors. One factor was the involvement of other big name corporate sponsors. Since the other parties involved are covered by secrecy agreements and Non-Disclosure agreements until the unveiling, it may not make total sense to you till it is complete. All I can ask is for everyone to maintain their interest and enthusiam, but please be patient. It will all make sense at completion. I think Speakeasy Customs and Classics will do complete justice to this historic project. They seem to have all the skill sets required. The most important aspect however, is what I suspect to be a very large dose of enthusiasm and commitment…They will not disappoint. Ian I’m with you on this one. I hope the restoration goes great. I will write below what I witnessed first hand. You were given a job that you started, blindsided and lied to. Then the job was publicly given to someone else. You sir deserve a big applause for keeping your cool and composure. I would have flipped my lid. Getting fucked isn’t even the word for it. Sorry this happened to you. You didn’t deserve that treatment. I think the problem is with the new owner. I understand he still wanted the ‘Voo Doo Sahara ‘ on display at his museum after he removed Larry from the restoration. Come on . Give you head a shake. Yes I heard that too. Imagine that… removing a historic restoration from you after starting it, lying and deceiving you, and then having the nerve to say “hey when are you going to bring your car back to my museum?” Unbelievable. Great story! I have been looking for a shop to do some custom work and you guys seem like the perfect fit for my ’70 Olds 98 convertible. Will be in touch. The amount of gold plating to do on the GS is a huge task. 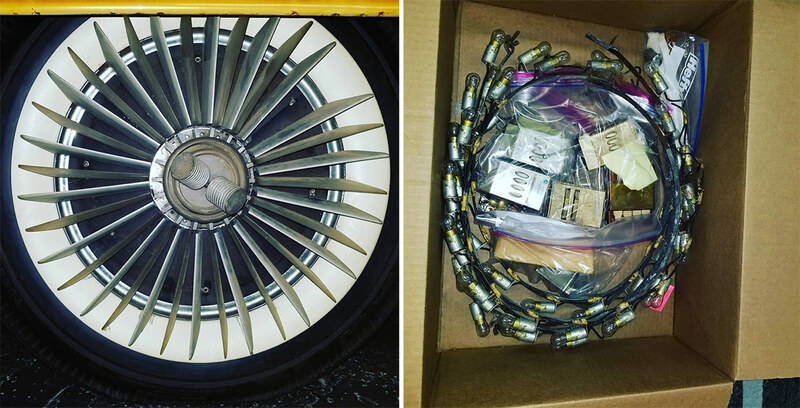 A lowrider shop is actually the perfect place to do that type of restoration. Most lowrider builds Ive seen are the most detailed and definitely dedicated builds you will ever see till this day. The detail work on a traditional lowrider is almost extraterrestrial. I wish the shop well on the journey of bringing back the GS. Happy New Year!! Looks as if this shop is the correct one. There’s a lot of creative artistry in both Greg, the owner, and his former boss, Mondo, an obvious premier painter. So what if they aren’t from California, but Chicago, instead? They’ll come out of this not only okay but much better than okay. I never take the time to post comments online. This story just had to be told. In the end I hope the Sahara gets the restoration it deserves but I doubt it. No disrespect to the current builder of Speakeasy. I’ve never meet him or been to the shop. According to him this is a new venture for him. I only have seen online pictures. They may do good work within their parameters. The bottom line and plain truth is that primarily his “custom” shop consists of lowriders, paint jobs, and suspension work. The restoration work shown has been for cars kept close to stock. I have yet to see any full custom work. Nothing close of the caliber that the Golden Sahara holds. Now I am recounting what I witnessed first hand and what nobody has seen or heard. I happened to be in the right place at the right time. I had no affiliation with Voodoo Larry or his other workers present at the time.I took a trip to Chicago in July. Was planning on visiting some breweries,custom shops, and attend Voodoo Larry’s open house for my birthday present to myself. I went to Larry Klairmont’s Museum midweek. There I was able to see the Golden Sahara and Voodoo Sahara side by side. What a sight it was. Voodoo and crew were there speaking to Mr. Klairmont about the restoration. I introduced myself to everyone. It was a laid back atmosphere. I was able to hang out and hear the conversation while they spoke of plans right there in front of the car on the showroom floor. I was in awe to be there that moment. To my surprise however, the Golden Sahara was being torn apart on the showroom floor. Original emblems and parts just sitting on the fenders, and all around the car actually. It was being gutted of all the electronics in the dash and the trunk by the “mechanic” across the parking lot. Apparently he does a lot of work for Larry on his other cars. There was no logging or documenting of parts or placement. The guy had some Harbor Freight looking electrical wiring parts and terminal ends. I was shocked. Being Mexican and speaking Spanish I was able to talk to they guy about the GS and what was going on. That helped in me being able to sit in the GS and take a picture in it!!! I could tell he was irritated that VL was there. Mr. Klairmont had given him the job or he assumed it was his as he was already working on it and was now being given to VL and crew. I heard first hand and saw the hand shaking of the deal being done and given to Voodoo Larry. Mr. Klairmont wanted the restoration to be done in 6 months, he also did not want the GS to leave his museum. VL told him a restoration of this caliber could not be done in the museum, especially on the floor, and the tools and equipment required needed a functional shop. I also heard VL say he could do the restoration in a year. Although Klairmont wanted it done instantly VL numerous times emphasized the fact that a restoration like this was not an overnight job. About a week later was Voodoo Larry Kustoms open house. Mr. Klairmont attended again announcing and acknowledging VLK doing the restoration of the GS. There was a small display in VL shop with parts from the GS. Being a fellow Marine, Jeff gave Mr. Klairmont sand from Iwo Jima where he had fought in WWII. There appeared to be a real bond between them. There was no doubt or denying that Voodoo Larry Kustoms would take on this restoration. Then fast forward September and its officially announced by Speakeasy that they are doing the restoration and documentary. WTF???????? Shocking doesn’t describe the words. I immediately was brought back to Klairmont’s room in his museum dedicated to WWII and the Marines. Posters with the words honor, integrity, pride plastered on the wall. It seems to me Mr. Klairmont forgot those words in the deal of the restoration. To break a bond and handshake with another fellow Marine is unacceptable in their circle and should be among most decent people. To make promises and just lie to someone in the face? In the end he probably went with who was cheaper and faster. That is how he made his choice for the restoration not by who was the most qualified. In my opinion who more qualified to restore the Golden Sahara than the man who built the Voodoo Sahara in tribute to the Golden Sahara with no real dimensions to go by and mere pictures. My hat off to you Voodoo Larry. I don’t know how you can take the high road, keep your composure, and not tell the truth after being lied to and stabbed in the back.That says a lot about your character. Keep up the incredible builds. I hope you don’t mind me telling my story. Sorry for the long post just wanted to write my direct experience in the matter. I am sure everything you are saying is accurate, especially if you were there. However just like with everything else there are always two sides of a story. Unfortunately due to Speakeasy having a Non-Disclosure Agreement we have not been able to tell our side at all. Also in case you don’t follow Voodoo he has told his side of the story plenty on social media, Instagram and Facebook, on more than just his own pages. In a couple of months, hopefully sooner we will be able to talk about his publicly. But i can tell you this much, Speakeasy has text messages to prove that they have been involved with the Golden Sahara since May 22nd just 2 days after it’s purchase and well before that meeting in July. We were asked to do a few tasks and it was because of those tasks that the car eventually made it to Speakeasy. The rest of the story will come out soon. 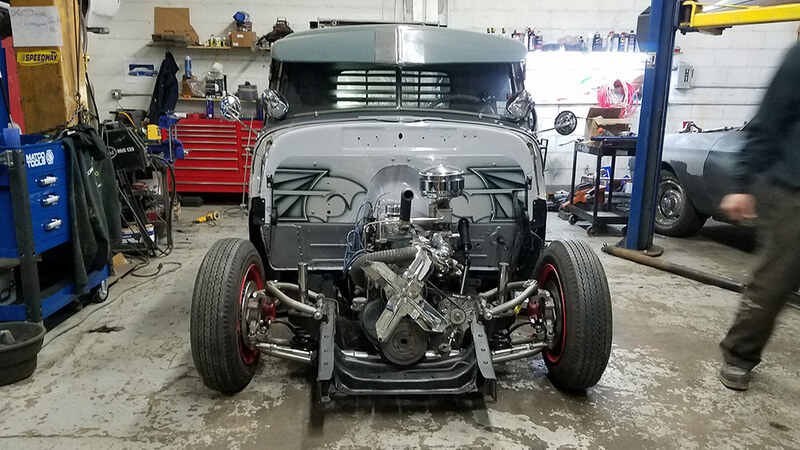 I would also like to say that yes we build primarily Lowriders and are proud of it, however that is not all we build and we are looking forward to getting into more and more types of builds as our shop grows. Also yes Greg is a new comer to the industry, but everyone who works as hard as he does to come as far as he has in just 5 years deserves a chance at their big break. We are extremely proud to be working on the Sahara and we hope everyone will appreciate the insane amount of hours that we have put into her over the last 3 months. Speakeasy-I didn’t mean my comment to seem negative towards your shop. As I wrote I’ve never meet you guys and only seen work that has been posted. 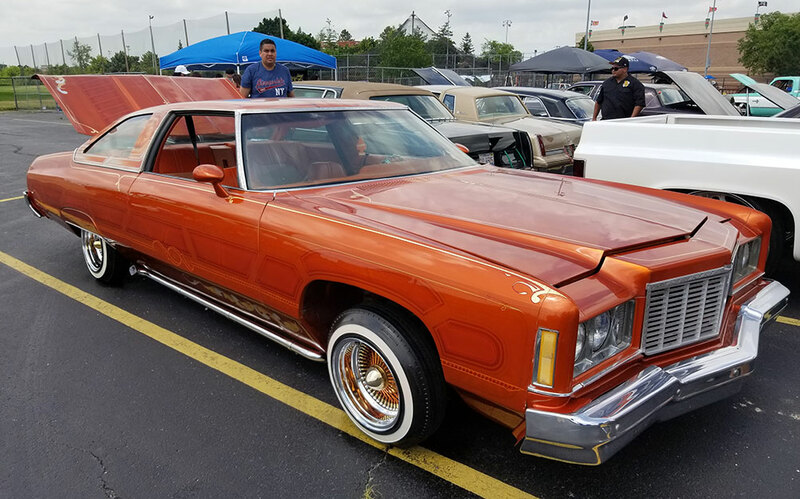 Your work seems fine (and much better than what I can do), it just appears to cater primarily to the lowriding community. Nothing wrong with that. Not trying to discredit you or your hard work. I only commented that in my opinion such a grand restoration should seemed to have gone to Larry. I don’t think anyone can deny his qualifications and love for the Sahara. My main issue, frustration, and point I wanted to set straight with what I myself was directed at Larry Klairmont. If you were given the job right after the purchase of the Sahara then that shows how much of a conniving shyster Larry Klairmont is. Then why would VL have the skirts and cubes in his shop in July if he was not going to do the restoration? Why would Klarimont make a handshake deal on the showroom floor with Voodoo and his upholsterer? Why would Klairmont show up at Vodoo Larry’s open house again acknowledging him doing the restoration in front of a Sahara display? Making at least two other people (the mechanic across the way, and Voodoo Larry) believe they were themselves going to do the restoration. As old as he is he should know better. I think anyone in Voodoo Larry’s shoes could understand his frustration and feeling of stabbed in the back. This doesn’t mean you are at fault. This is 100% Larry Klairmont at fault. In fact this has now lead to bad vibes and pitting shop against shop. Whatever his agenda is, I think Klairmont has played many people and turned this into a circus. Congratulation on this once in a lifetime opportunity and good luck with the restoration. You have a world full of fans now waiting to see the Sahara come back in all its glory. I would like to say you have done an AMAZING job in the time that you have had the car. After seeing how the car looking now EVERYONE will feel the same way. Also who cares if the primary work you have done is one lowriders. 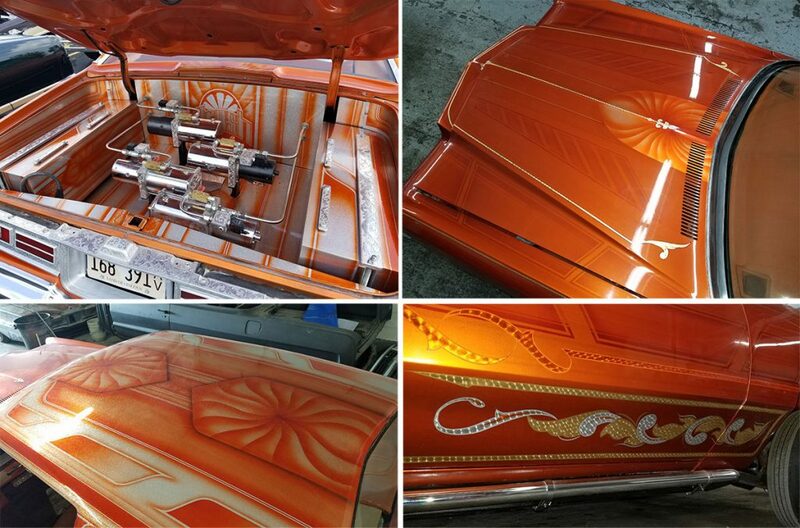 If someone doesn’t know that a low rider has so much detail work done to them then most custom cars. 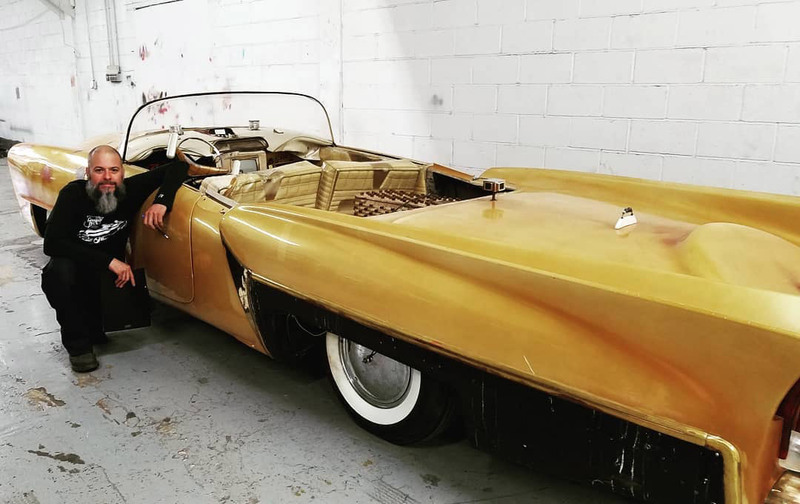 The Golden Sahara II is truly a custom/early styled lowrider. Never make assumptions on the unknown. Everyone seems to be an authority on issues they no nothing about. Like a divorce…..only two people really know what happened. Big time props to Speakeasy for the incredable job they did with bringing the Sahara back to exhibit standards……..and in an amazing timeline! I do’t know these guys @ Speakeasy, but I like em. I’ve not seen the car in person yet but I,m more than familiar with this car and I say it looks acurate, and exquisite.